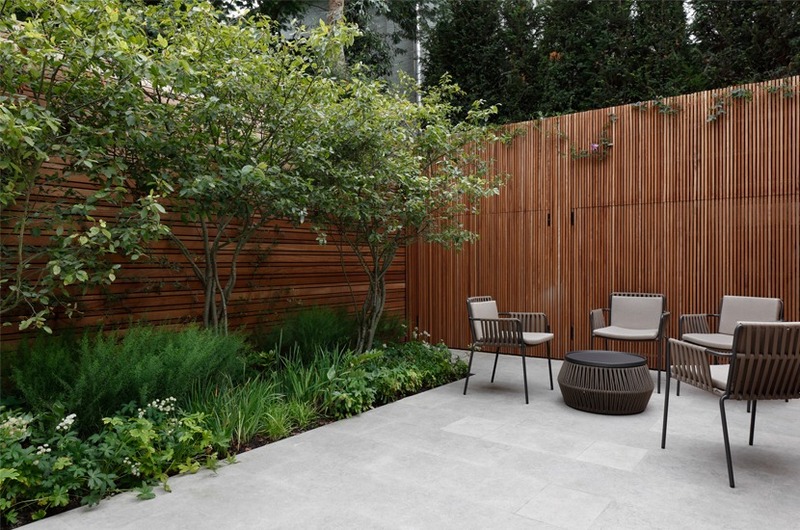 We always give ourselves plenty of time to consider the position of outdoor seating and dining areas, because it’s these elements that complete the narrative of a garden and highlight the purpose of a design. When it comes to making decisions about furniture, much depends on the scale and layout of the space. 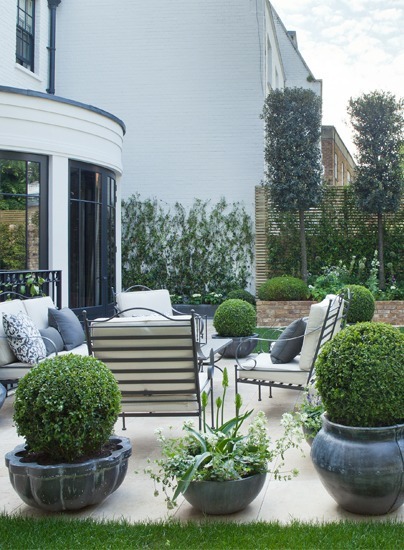 In a small garden we tend to use corner or L-shaped seating, and this allows us to use a greater proportion of the space for planting, trees and other green areas. 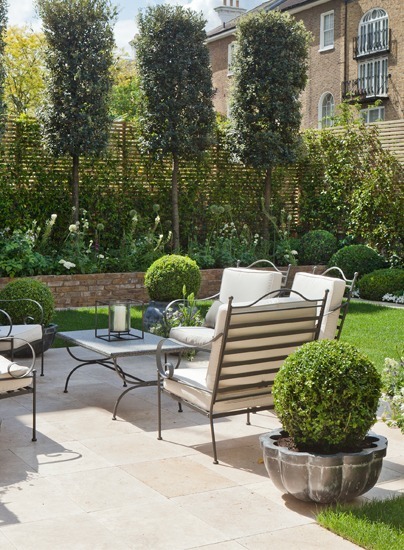 In the south-facing garden of Cresswell Place we have matched the scale of the furniture to the size of the property. We designed the area around two very pleasing focal points: the “observatory” window of the house on one side of the garden and the sandstone water feature directly opposite it on the other. In this project we took a different approach by introducing L-shaped furniture that creates a very much more luxurious effect than the standard layout. This enabled us to maximise the space while making the fireplace and table central to the design. Each of our clients receives the proposal for a design that is unique to them. 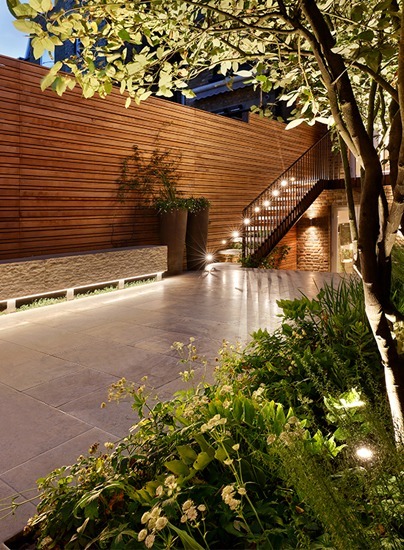 That’s why we often take a cue from materials, colours and shapes inside the house. 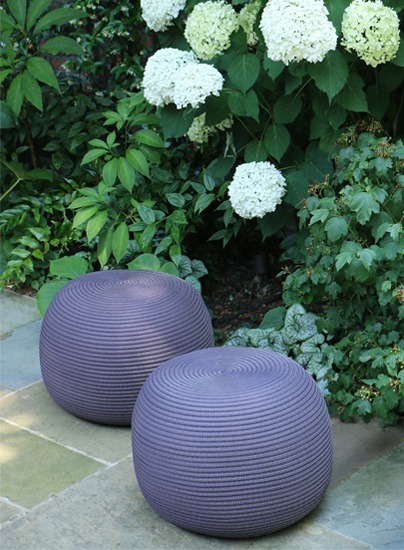 We then source a wide range of materials from many different suppliers so that we can reflect these colours and shapes in bespoke furniture and other features in the garden, an approach that brings an overall sense of harmony to the design, inside and out. 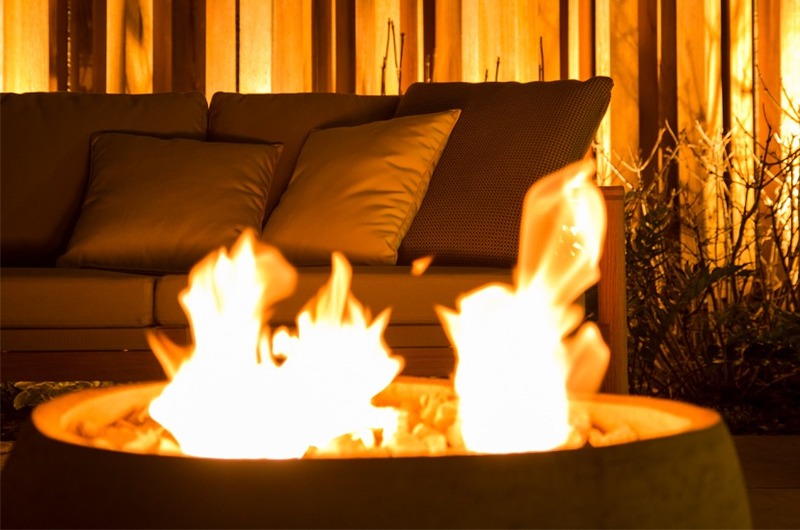 We create bespoke fire pits from terracotta pots, fitting them with timber tops so that they can double as tables when not in use, a solution that maximizes outdoor space. Here in the Alexander Square project these is an example of a fire pit that burns eco fuel and is simple both to light and to use. When it’s not needed, it can be covered and used as a compact coffee table. 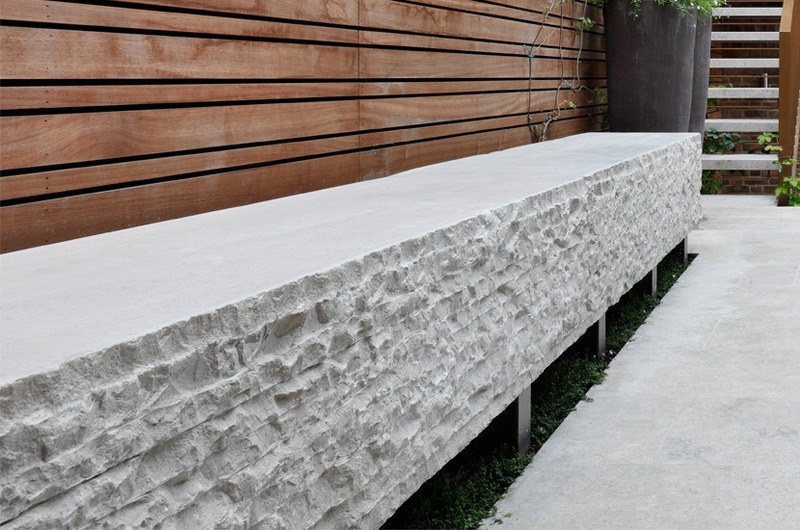 The stone bench against the wall of the upper garden mimics the design of a bench inside the house, and this creates a robust link between inside and out. 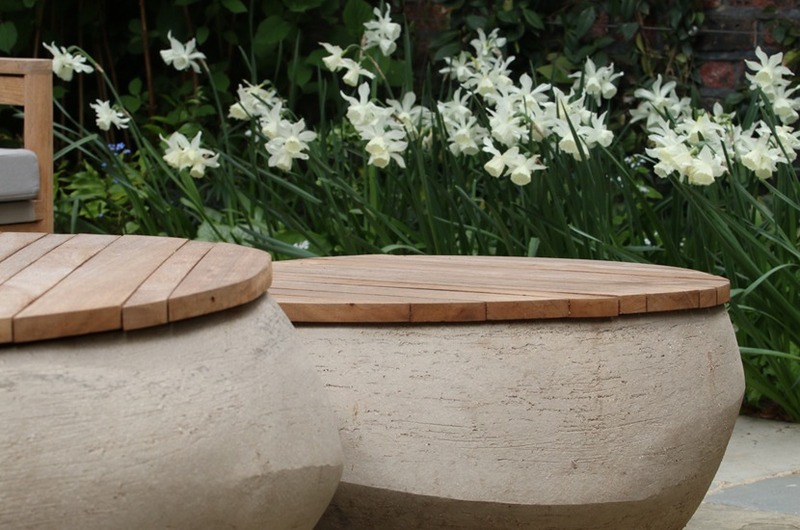 The structure is supported by three hidden legs, giving us enough space to plant the ground cover that cascades from below the bench, softening its edges. 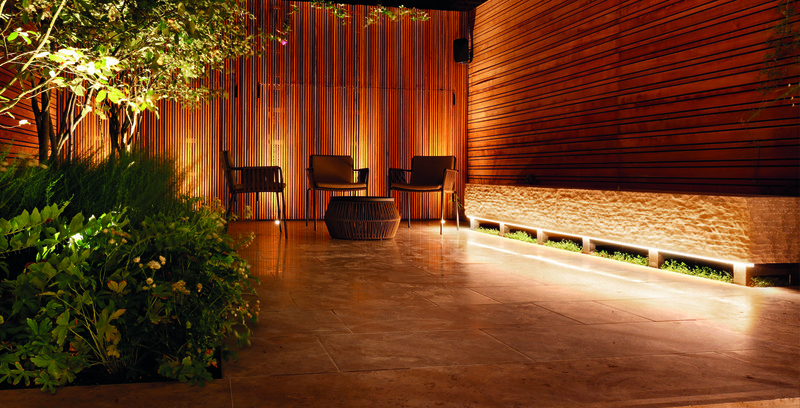 This beautiful image is accentuated by spotlights to highlight the sharp surface textures of the stone.